Look for Chrome Prospect Autographs of Gleyber Torres, Ronald Acuna, Jr., Eloy Jimenez, Nick Senzel, and Mickey Moniak! 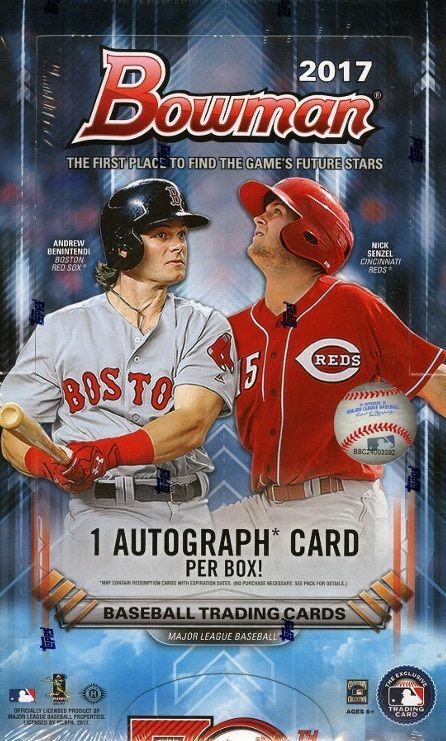 Key Rookies: Andrew Benintendi, Yoan Moncada, Manny Margot, Aaron Judge, Dansby Swanson, Alex Bregman, Hunter Renfroe, Carson Fulmer, Reynaldo Lopez, Jharel Cotton, Yulieski Gurriel, Ryon Healy. Key Prospects: Ronald Acuna, Jr., Vladimir Guerrero Jr., Eloy Jimenez, Cody Bellinger, Nick Senzel, Lucas Erceg, Victor Robles, Clint Frazier, Blake Rutherford, Mickey Moniak, Lourdes Gurriel Jr., Tyler O'Neill, Lazarito Armenteros, Kyle Tucker, Dane Dunning, Chance Sisco, Anderson Espinoza, Brent Honeywell, Tetsuto Yamada, Yoshitomo Tsutsugo, Tomoyuki Sugano, Takahiro Norimoto, Rafael Devers, Franklin Barreto, Michael Kopech, A.J. Puk.